(U) “1. The police shall perform their duties under the leadership of the Minister of Interior in the capital, as well under the affect of the respective governor and district-governor in the provinces and districts. (U) Please note the designation of appointed political leadership over the police in Afghanistan. This unusual operational relationship creates an environment that fosters some of the pay-for-position corruption, nepotism, and incompetency observed in police agencies in Afghanistan. (U) As described in the section on police operational control and duties, Article Four of the Afghan Police Law designates Provincial and District Governors as leadership over the police at the provincial and district levels. The governors don’t actually command the police but rather delegate this authority. The AUP are assigned to police districts under an appointed District Chief of Police (DCoP) who is subordinate to the District Governor. All the districts within a province are controlled by an appointed Provincial Chief of Police (PCoP) who is subordinate to the Provincial Governor. (U) Zone commanders are appointed and responsible for zones that correspond roughly to the International Security Assistance Force (ISAF) military Regional Command (RC) structure reflecting ISAF’s influence. Although these zone commanders may seem logical from a military command and control perspective and may have been intended to interact with ISAF RC commanders on an equal basis, they are an additional layer of command and control that do not contribute directly to the AUP’s community policing as described in the ANPP. 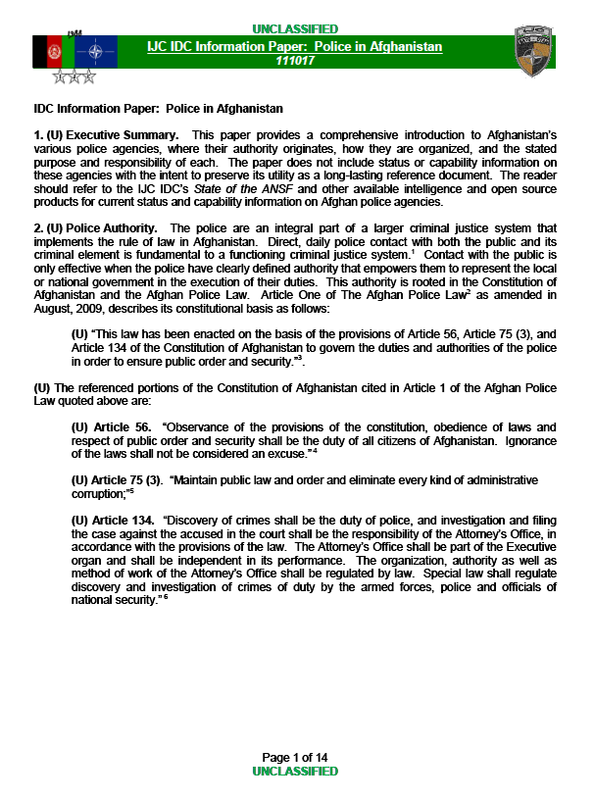 Sub-paragraph 2 of the 2009 amendment to Article Four of the Afghan Police Law was inserted “Police perform their duties according to this law and follow their organizational chain of command”. One may infer this has given AUP Zone Commanders authority under the Afghan Police Law where they formerly had no specified authority. (U) DCoPs, PCoPs, and Zone Commanders are appointed positions and not locally elected positions nor positions filled meritoriously from within the local police ranks. This appointment system contributes to some of the pay-for-position corruption, nepotism, and incompetency in the police leadership ranks. Within law enforcement culture, leaders who are promoted from within the ranks are more likely to be held in higher respect by their subordinates than “outsiders” who have been appointed to a leadership position.